So when you think whiskey, you usually jump first to Scotland, then to the US, Canada, Ireland, and if you’ve gotten into it, Japan, India, and Australia. However I am excited at the idea of other countries making whisky for themselves. It’s the possibility of different flavours, terroir, and techniques to try new things. I worked out great for the wine industry, why not the whisky industry? 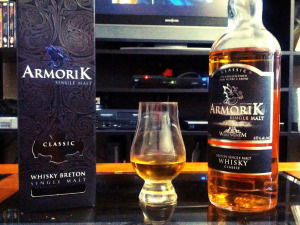 That’s partially why I picked up the Armorik Breton Classic Single Malt. It’s from France, which you typically don’t hear about making anything beyond Wine and Brandy. But it makes sense, as half of France (specifically where this one is found, Breton) was controlled by the UK. Someone had to wander about the Empire and make whisky somewhere, right? Also picked it up as the price was pretty good for the Abv., non-chill filtration, and no colouring.